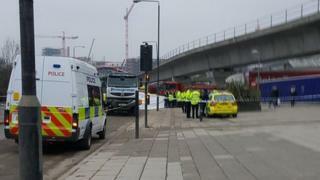 A third cyclist has been killed in four days on London's roads. Ben Wales, 32, was involved in a collision with a tipper truck in North Woolwich Road, Silvertown, east London, at about 13:30 GMT on Thursday. Emergency services attended but Mr Wales, who worked at a nearby sugar factory, was pronounced dead at the scene. No arrests have been made. The Mayor of London, Sadiq Khan, said he was "saddened to learn of the tragic deaths on London's roads this week". Mr Wales died near to his work at the Tate & Lyle sugar refinery. Craig Bennett, factory manager at Plaistow Wharf, said: "Ben was a valued member of our team since 2015. "In that time he made a big impression on us all and was well loved by his colleagues. Our thoughts are with his young family. He will be sorely missed by us all." Two other cyclists were killed in the capital within hours of each other on Monday. Anita Szucs, 30, died after an apparent hit-and-run on Bounces Road, Enfield, while architect Karla Roman, 32, was killed in a crash with a coach on Whitechapel High Street, Tower Hamlets. Campaigners from the London Cycling Campaign are calling for the mayor to improve safety for cyclists and pedestrians on the capital's roads. Activists want Mr Khan to build "high-quality cycle tracks" and ensure junctions frequently used by those walking and cycling are safe. Campaign group Stop Killing Cyclists are planning a protest outside the Treasury on Horseguards Parade on Saturday. The "die-in vigil" will call for 10% of the transport budget to be spent on pedestrian infrastructure by 2020. The Labour mayor is "determined to make walking and cycling safer and easier for all Londoners" a spokesman said. Leon Daniels, TfL's managing director of surface transport, said: "Our thoughts are with the families and friends of those who have tragically lost their lives on London's roads this week. "Any death or serious injury on our roads is one too many, and our priority is to eradicate them. "We're investing in safer cycle lanes and junctions, working with London boroughs to introduce more 20mph limits, looking to remove the most dangerous heavy goods vehicles from the capital's roads by 2020 and continuing our road safety education and enforcement programmes."